Can you introduce solids before the age of six months? What are the ideal first foods for a baby? How much to feed the baby? Can your baby still have breast milk and formula? Is it safe to give the baby fruit juice? Can a six-month-old have finger foods? Babies can start weaning on solid foods once they are six months old. But when the time comes, choosing the correct blends for the first few times for the baby can be tricky. If that is your predicament too, MomJunction is here to help you. 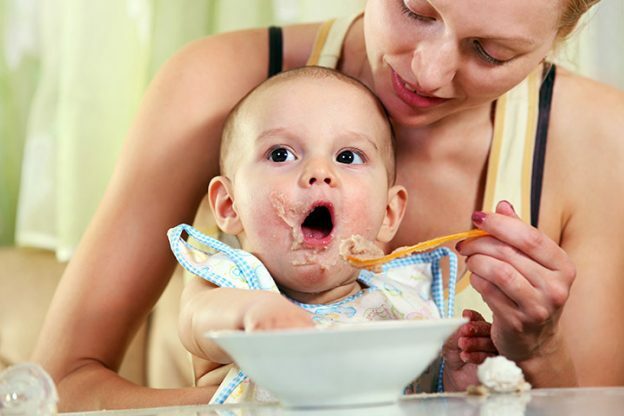 In this article, we bring you the best first foods for the baby, with recipes to prepare them. 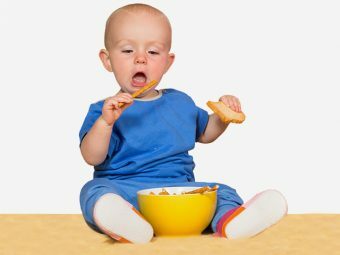 Can You Introduce Solid Foods Before The Age Of Six Months? It is not advised to feed the baby anything other than breastmilk for the first six months as the baby’s immune and digestive system is very sensitive. But if the mother is not able to produce the required amount to breast milk or the baby’s needs are not fulfilled by milk, one can introduce infant cereal after the age of four months. 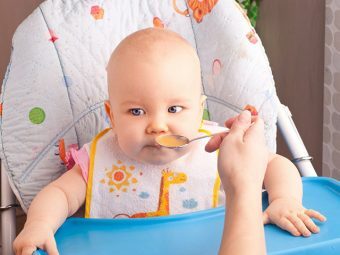 Once the baby turns six months, complementary foods along with breast milk should be introduced, it is best to start with pureed food and then once the baby starts teething some solid foods can be given. What Are Ideal First Foods For Babies? The first foods for the baby are the ones that are gentle on the stomach, easy to swallow and have the least tendency to trigger food allergies. These foods can be categorized into four categories: fruits, vegetables, meat, and grains & cereals. Here is what you can give your baby as the first solid food (1) (2). You should include at least one teaspoon of additional fat either butter or ghee in the food purees as they would increase the calorie density, enhance the taste and increase the absorption of fat soluble vitamins A, D, E and K.
This is a simple puree with a dash of sweetness and plenty of nutrition. Peel the skin off the sweet potato and cut it into small cubes. Transfer them to a cooking vessel with enough water to submerge the sweet potatoes pieces. Boil the vegetable on a medium flame for 15 minutes, with the lid partially closed. Boil the carrot separately for 5 minutes on medium flame. Check with a fork if it has softened. If not, then boil for some more time. Let the boiled vegetables cool. Transfer them to a blender, add the carrot or sweet potato stock, and blend till you get a thick puree. Green beans and carrots are rich in vitamins making them an excellent first food for the baby at the age of six months. Put the green beans and carrots together in a cooking vessel with just enough water to submerge the vegetables. Boil the vegetables for 25 minutes on a medium flame, with the lid partially closed. Strain out the vegetables and let them cool. Transfer them to a blender, add some water, preferably the boiled vegetable stock, and blend till you achieve a thick puree. it’s a good combination of vitamin-rich carrot with the carbohydrate-rich rice. Wash the rice thoroughly with water and put it in a cooking vessel. Add the chopped carrots too and fill it with water. Ensure the rice and carrots are entirely submerged. If needed, add more water. Cook them at medium flame for 25 minutes with the lid partially closed. Continue cooking till the rice and carrots are soft. Once ready, mash the rice and carrots using a fork so that it is easy for the baby to eat. Oats are rich in fiber and ease constipation, while broccoli provides several vitamins. Boil the steel-cut oats for 10 minutes and let them soak in the water for 11-12 hours, or overnight. Boil the soaked oats in the same water for 15-20 minutes on a medium flame. Keep stirring to make sure the oats are evenly cooked. Boil the broccoli in a cooking pot for 10-15 minutes on a medium flame, with a partially-closed lid. Let the broccoli cool, and sieve it out. Add it to the cooked oats and stir them to mix. Use a fork to mash them so that it is soft and easy for the baby to eat. The sweet and buttery flavor of this mash will certainly leave your baby lip-smacking. Boil the sweet potatoes for 15-20 minutes on a medium flame. Steam the squash for 10 minutes on medium flame. Let the squash cool. Mix the squash and sweet potatoes in a bowl. Mash them using a fork before feeding it to the baby. Chicken broth is an easy-to-prepare non-vegetarian first food. Chicken broth is the fastest prepared in a pressure cooker. Cook the chicken in a pressure cooker up to one whistle. Turn the flame to simmer and let the chicken cook for 25-30 minutes. Turn off and let the steam release naturally. Strain the chicken out and collect the broth. Let the broth cool before feeding it to the baby. Finger millet, also known as ragi, is rich in minerals along with chicken containing several micronutrients. Fill a cooking vessel to half with water. Mix the finger millet flour smoothly and bring the mixture to boil. Once the mixture boils, simmer and let it cook for 7-10 minutes. Keep stirring so that there are no lumps. If you feel the consistency is thick, then add some more water. Cook the chicken by boiling it in a separate vessel for about 25 minutes on a medium flame. Check if tender and boil for more time if needed. Let the cooked ragi and chicken cool and transfer the two to a blender. Blend till the ragi porridge and boiled chicken have mixed evenly. This is a hearty first food recipe for the six-month-old baby. Boil the meat in a cooking vessel for 30-35 minutes on a medium flame, with the lid closed partially. Do not discard the meat stock. In a separate container, boil the potatoes on a medium flame for 20-25 minutes. Cool the cooked meat and potatoes. Transfer to a blender, add the meat stock and blend till you achieve the desired consistency. This combination makes an ideal lunchtime dish for the little one. Cook the meat by boiling it on a medium flame for 20-25 minutes. Check if the meat chunks are tender and if needed cook for some more time. Let the meat stock cool a bit. Pour it into a separate cooking vessel, add rice flour, and rice to it. Bring the water to boil on the medium flame. Once the mixture boils, turn the flame to simmer and cook for 10 minutes while stirring to prevent the formation of lumps. After 10-15 minutes of stir cooking the rice, add the cooked meat pieces, and cook for a couple of minutes. Let the porridge cool, mash it with a fork to give it a thick consistency and to break the meat chunks into tiny pieces. This one is colorful and quite likely to draw the baby’s attention. 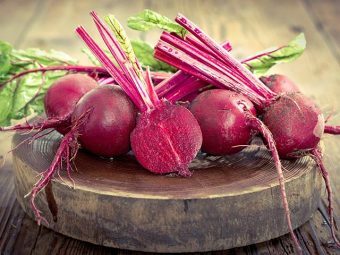 Boil the beetroot for 20 minutes on a medium flame with the lid partially closed. Check if they are tender and boil for more if required. Do not discard the beetroot stock. Sieve out the beetroot pieces. Transfer the beetroot stock to another cooking vessel. Add the chicken pieces to the beetroot stock and boil the chicken for 20-25 minutes on medium flame. Once done, sieve out the chicken, let it cool. Put the chicken pieces and beetroot in a blender, add some beetroot stock and blend until you achieve the desired consistency. A tasty delight that works well as the first food and also perhaps as the first dessert for the baby! Cook the apples, with the nutrient-rich skin, by boiling them in water for 15-20 minutes on a medium flame. Check if the apples and the skin are well cooked. Once the apples are tender, sieve them and let them cool. In a cooking vessel, add about an inch of water. Place the blueberry on a steamer basket and steam for 15-20 minutes. Steaming the blueberries softens the skin of the fruit and also the fruit that is only partially ripened. Cool the blueberries and then transfer them to a blender along with the cooked apples. Add some water and blend till you achieve a thin puree. Babies love sweet flavors and here is something that is both sweet and creamy. Put the banana and avocado pulp into a large bowl and mash them using a fork. Add some water if needed to thin the consistency. Keep mashing till you attain a thin, easy-to-eat fruit mash. Peaches provide several vitamins and minerals that are essential for the growing baby. Boil the peaches for 15-20 minutes on a medium flame. Do not discard the fruit stock. Sieve out the peaches. Add rice to the fruit stock and bring it to boil. Once the water boils, bring the flame to simmer. Keep stirring the mixture and continue cooking for 10-15 minutes. Add the cooked peaches and cook for a couple of minutes before turning off the flame. Apple and pear taste great together and make an ideal first food for the baby. Boil the pears and apples together in a cooking vessel for 20-25 minutes on a medium flame. Once done, sieve them out and let them cool. Transfer them to the blender, add some water, and blend till you attain the desired consistency. If your baby has an appetite for anything that tastes sweet, then here is something that they will love for sure. Fill a cooking vessel with about an inch of water. Place the blueberries on a steamer and steam them for 15 minutes on medium flame. Peel and chop the banana. Put it in a large bowl. Add the steamed blueberries and mash them all together. Add a cup of water if the mash appears too coarse. These are some of the best recipes to feed your baby as their first food. You can also try other recipes with fruits and vegetables, but make sure that the dish is soft and easy for the baby to digest. Next, we answer a few questions on introducing first foods to your baby. How Much Can You Feed The Baby? The quantity depends on the preference of your baby. As a rule, you can stick to a maximum of two tablespoons of fruits, vegetables, and meat each in a day. You can also give three to five tablespoons of infant’s cereals and grains (3). Give an assortment of food items for a balanced diet. You can feed solids twice a day. If you sense your baby is going hungry or demands more solids, then offer more. If the baby resists or shows no interest in the food after one feed, then he or she is probably full or not interested at the moment. Can A Baby Still Have Breast Milk And Formula? Of course! Your baby will get plenty of essential nutrition from formula and breast milk since they contain several micronutrients. Breast milk also contains antibodies, which ensures strong immunity. You can breastfeed your baby even beyond the age of two years when the breast milk provides a third of the baby’s nutritional needs (4), but the doctors advise to feed only upto 1 year as longer than that can put a strain on the nutritional stores of the lactating women so maybe as the baby grows you cann reduce the number of breast feeds and feed more of weaning foods to the baby. 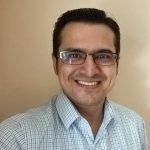 Is It Safe To Give Fruit Juice To A Baby? No. You must not give fruit juice to a baby since it contains surplus sugar. Fruit juices also have less nutritional value then whole fruit (5). Pediatricians around the world recommend waiting at least till the baby is one year old before giving fruit juice (6). Not yet. Finger foods can be overwhelming for a baby who is just starting on solid foods. Wait at least until the baby completes seven months before introducing finger foods like carrot,cucumber, radish sticks (7). These first foods for babies are nutritious, delicious and filling. Prefer homemade baby food to packaged food, which might have additives or preservatives,they can even hamper the digestion of the baby. Also, give your baby some freedom of choice when feeding solids and do not force-feed them. Working with your baby can elicit a greater acceptance of solid foods, and keep your baby interested in new foods. Introduce only one type of food at a time so that the baby can develop a taste for it. 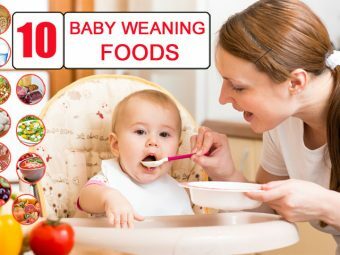 The baby initially may be hesitant towards the taste but, if the same food is fed regularly, he/she will develop a taste for it in approximately one week. For eg, if you feed your child potato puree and the baby refuses to eat it, don’t pass this food option as yet and try to feed it at least for seven days and the baby may develop a taste for it. What was your baby’s first food? Share your baby’s first food recipes in our comments section. 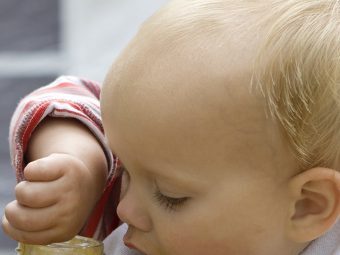 Is Almond & Peanut Butter Safe For Babies?